1 CONCORDIA UNIVERSITY Concordia University is a Lutheran higher education community committed to helping students develop in mind, body, and spirit for service to Christ in the Church and the world Main Financial Aid Office Michigan Financial Aid Office N. Lake Shore Drive 4090 Geddes Road Mequon, WI Ann Arbor, MI (262) (734) FINANCIAL AID INFORMATION This document contains the necessary information to enable you to obtain maximum financial assistance. Because of the great demand for aid, you should study this information AND begin the application process now. NOTE: If your completed application for aid is received by MARCH 15 th, you will receive full consideration for institutional aid. Late applications will be subject to the limitations of remaining resources. FIRST-TIME CU STUDENTS If you plan to attend Concordia University beginning in the Fall, then the process of applying for financial assistance should begin soon after January 1, with the completion of a Free Application for Federal Student Aid (FAFSA) online at RETURNING CU STUDENTS January is the time to apply for financial assistance for the next school year. Follow the procedures you took last year in obtaining aid from private sources, such as your home congregation or your LCMS district. Also, use this document to become familiar with other sources of financial assistance. You may be entitled or eligible to receive funds from several sources. REMEMBER: You must submit a FAFSA each year by MARCH 15th. GRADUATING STUDENTS Most seminaries and universities set early deadlines, (March 15 or April 1) for financial aid requests. If you wish to apply for financial aid, make early contact with the financial aid office of the graduate school you wish to attend. Request the necessary forms and carefully follow all directions. You may obtain information about filing a FAFSA from our Financial Aid Office located in the Administration Building, LU-107, or in the Michigan office location in Student Services Building. COMPLETION OR GRADUATION RATES The graduation rate is calculated for students who began attending Concordia in the fall of 2006 as first time, full-time freshmen. 59.1% of those students graduated from Concordia by May, 2012. 3 ACADEMIC PROGRESS Concordia has established a standard of satisfactory progress for all students who receive financial assistance. This policy is meant to ensure that only those students who make good progress toward their degree or certificate objective receive financial assistance. This standard must be met in order for a student to continue receiving financial aid. Satisfactory progress is defined as successfully completing course requirements for 67% of the number of credits for which you enroll and receive financial aid for, thereby making it possible for you to make good progress toward a degree or certificate objective. Successfully completing course requirements is interpreted to mean that a grade of at least D- or P is received by you. If you do not successfully complete 67% of the number of credits for which funding is approved during the semester, financial aid eligibility warning status is imposed. Aid automatically continues through one additional semester. If you do not make satisfactory progress during the semester of financial aid eligibility warning status, your eligibility for financial aid in later semesters is terminated. Eligibility can be regained by completing one semester under the conditions of satisfactory progress detailed above. An appeal procedure exists for you if your aid eligibility is so terminated. Refer to the CU Website for a complete statement of this policy. RENEWAL OF FINANCIAL AID Renewal of financial aid is based upon the following stipulations and principals: Renewal of grants or campus employment depends on financial need as determined by needs analysis and the availability of funds. Any part of your aid may be either declined by you or cancelled by CU if such assistance is not to your advantage or that of CU. As the available funds must be divided among all deserving students, grants or campus employment may not always be renewed in their previous amounts. You must maintain satisfactory academic progress toward your educational objective. Also, if your cumulative grade point average is less than 2.0, then gift assistance from CU will be reduced and you may be ineligible for Federal financial assistance. You may not receive financial aid beyond 150% of the normal completion time for your program. Should you have any questions, visit the financial aid website at or visit the Financial Aid Office in the Administration Building, LU-107. Our phone number is (262) Winterim Term The Winterim semester, which is a three long term in early January is considered part of second semester for Federal and State Aid purposes. 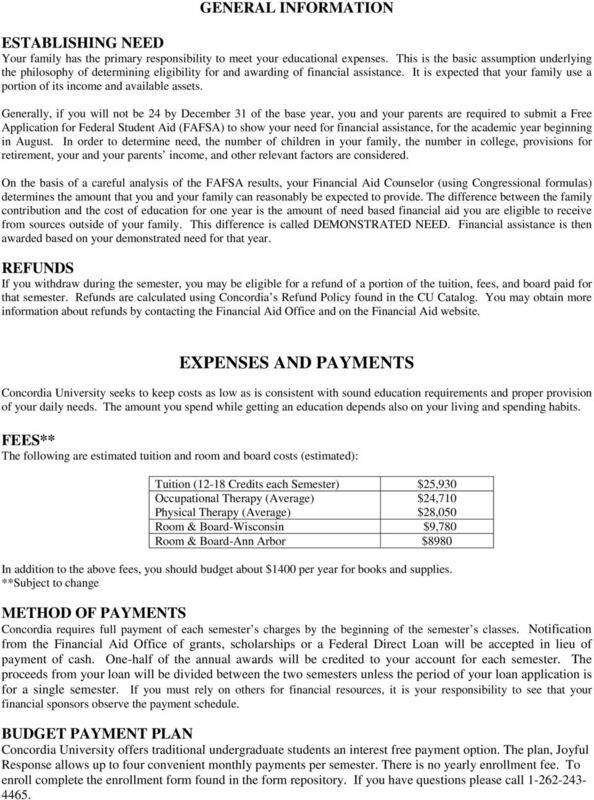 Extra costs associated with taking the Winterim term can be paid through Financial Aid. 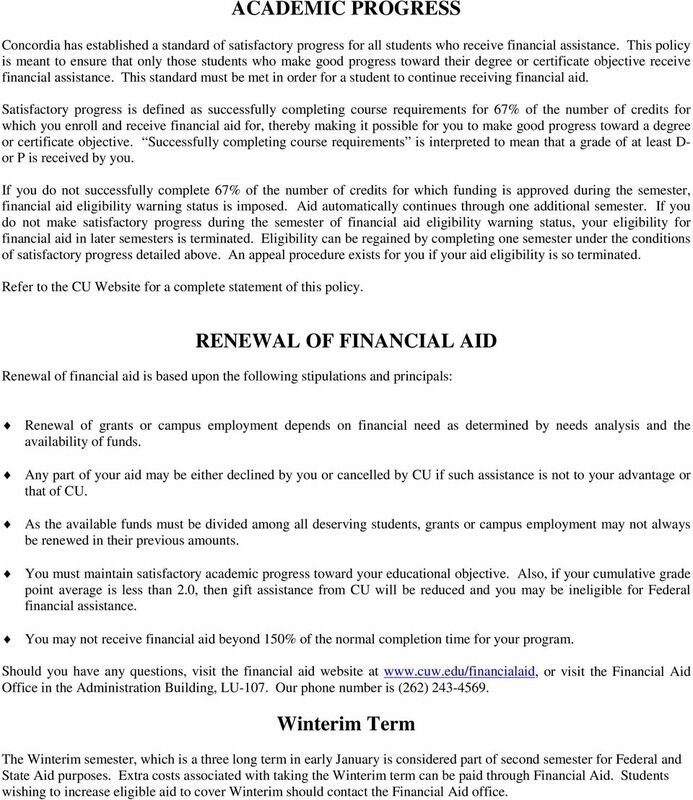 Students wishing to increase eligible aid to cover Winterim should contact the Financial Aid office. 4 FEDERAL GRANTS (Available to Undergraduate Students) GRANT Federal Pell Grant FWS/On- Campus Parttime Employment Gift aid (not repayable); ranges from $200 to $5730 per year. Eligibility is determined by Expected Family Contribution (EFC) calculated as a result of the FAFSA application. Accepted by most colleges or universities in the U.S. Available regardless of academic major. Offers opportunity to earn spending money while attending college. Offers opportunity to earn funds toward next semester s tuition costs. Offered to graduate or undergraduate students. Generally limited to 12 hrs of employment per week. American citizen or eligible non-citizen. Enrolled as undergraduate without a Bachelor s degree. Working toward degree or certificate. Must file a FAFSA ( Be at least a half-time student seeking a degree or certificate. Expected Family Contribution (EFC) of 11,000 or lower. Must file a FAFSA ( The Pell Grant will be awarded throughout the academic year. is available Jan 1. 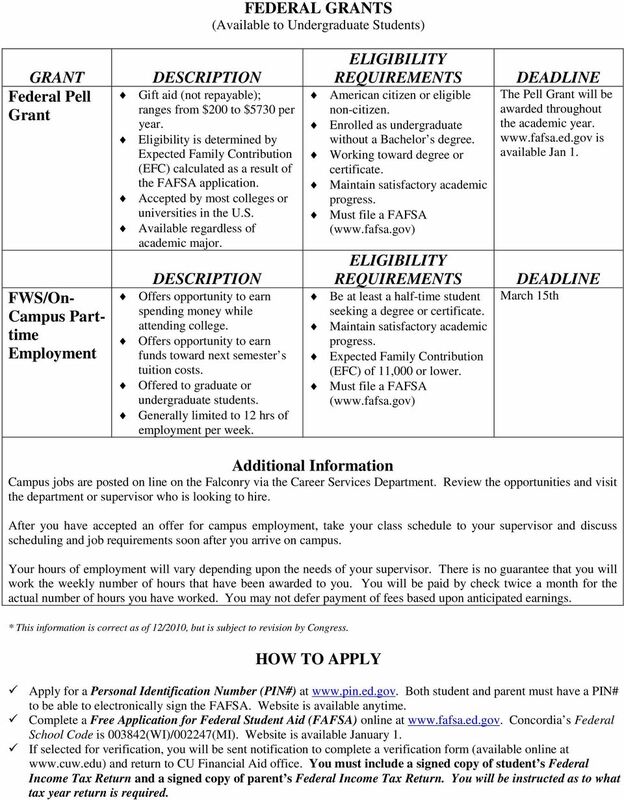 March 15th Additional Information Campus jobs are posted on line on the Falconry via the Career Services Department. Review the opportunities and visit the department or supervisor who is looking to hire. After you have accepted an offer for campus employment, take your class schedule to your supervisor and discuss scheduling and job requirements soon after you arrive on campus. Your hours of employment will vary depending upon the needs of your supervisor. There is no guarantee that you will work the weekly number of hours that have been awarded to you. You will be paid by check twice a month for the actual number of hours you have worked. You may not defer payment of fees based upon anticipated earnings. * This information is correct as of 12/2010, but is subject to revision by Congress. Apply for a Personal Identification Number (PIN#) at Both student and parent must have a PIN# to be able to electronically sign the FAFSA. Website is available anytime. Complete a Free Application for Federal Student Aid (FAFSA) online at Concordia s Federal School Code is (WI)/002247(MI). Website is available January 1. If selected for verification, you will be sent notification to complete a verification form (available online at and return to CU Financial Aid office. You must include a signed copy of student s Federal Income Tax Return and a signed copy of parent s Federal Income Tax Return. You will be instructed as to what tax year return is required. 6 borrowers will receive a Master Promissory Note (MPN), and a letter with instructions to go online to dlenote.ed.gov to complete the MPN. Return your award notification as soon as possible in order to begin the loan application process. 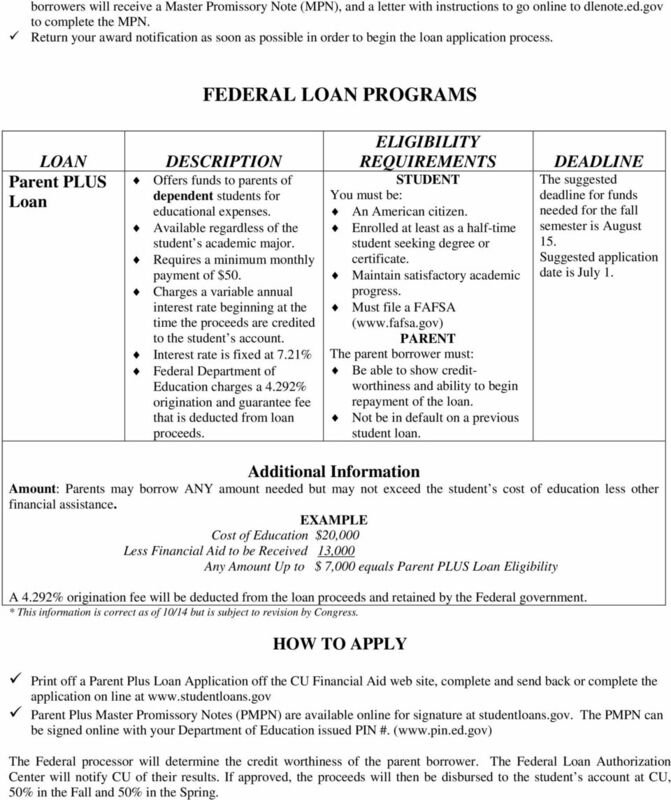 FEDERAL LOAN PROGRAMS LOAN Parent PLUS Loan Offers funds to parents of dependent students for educational expenses. Available regardless of the student s academic major. Requires a minimum monthly payment of $50. Charges a variable annual interest rate beginning at the time the proceeds are credited to the student s account. Interest rate is fixed at 7.21% Federal Department of Education charges a 4.292% origination and guarantee fee that is deducted from loan proceeds. STUDENT You must be: An American citizen. Enrolled at least as a half-time student seeking degree or certificate. Must file a FAFSA ( PARENT The parent borrower must: Be able to show creditworthiness and ability to begin repayment of the loan. Not be in default on a previous student loan. The suggested deadline for funds needed for the fall semester is August 15. Suggested application date is July 1. Additional Information Amount: Parents may borrow ANY amount needed but may not exceed the student s cost of education less other financial assistance. 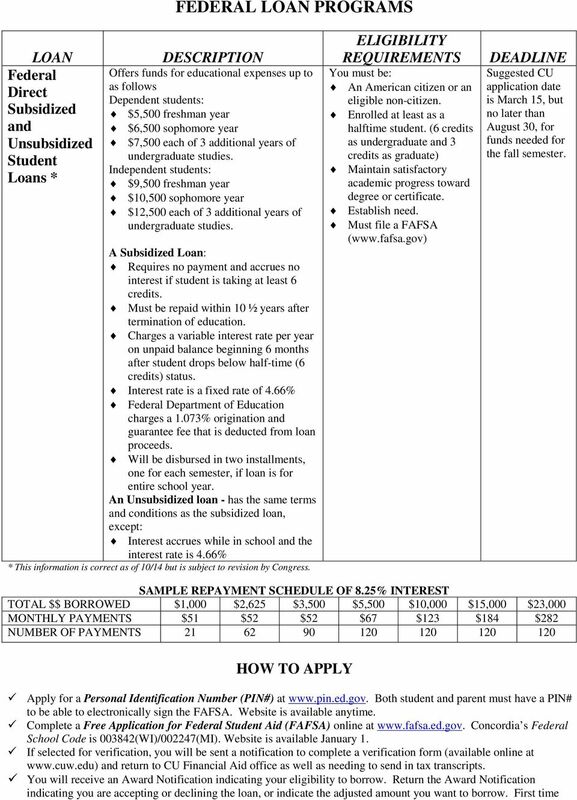 EXAMPLE Cost of Education $20,000 Less Financial Aid to be Received 13,000 Any Amount Up to $ 7,000 equals Parent PLUS Loan Eligibility A 4.292% origination fee will be deducted from the loan proceeds and retained by the Federal government. * This information is correct as of 10/14 but is subject to revision by Congress. Print off a Parent Plus Loan Application off the CU Financial Aid web site, complete and send back or complete the application on line at Parent Plus Master Promissory Notes (PMPN) are available online for signature at studentloans.gov. The PMPN can be signed online with your Department of Education issued PIN #. ( The Federal processor will determine the credit worthiness of the parent borrower. The Federal Loan Authorization Center will notify CU of their results. If approved, the proceeds will then be disbursed to the student s account at CU, 50% in the Fall and 50% in the Spring. 7 FEDERAL LOAN PROGRAMS LOAN Graduate PLUS Loan Offers funds to Graduate students for educational expenses. Available regardless of the student s academic major, but must be a graduate student Requires a minimum monthly payment of $50. Charges a Fixed annual interest rate beginning at the time the proceeds are credited to the student s account. Interest rate is Fixed at 7.21%. Federal Department of Education charges a 4.292% origination and guarantee fee that is deducted from loan proceeds. STUDENT You must be: An American citizen. Enrolled at least as a half-time student seeking degree or certificate. Be able to show creditworthiness and ability to begin repayment of the loan. Not be in default on a previous student loan. Must file a FAFSA ( The deadline for funds needed for the fall semester is August 15. Suggested application date is July 1. Additional Information Amount: Graduate students may borrow ANY amount needed but may not exceed the student s cost of education less other financial assistance. EXAMPLE Cost of Education $20,000 Less Financial Aid to be Received 13,000 Any Amount Up to $ 7,000 equals Graduate PLUS Loan Eligibility A 4.292% origination fee will be deducted from the loan proceeds and retained by the Federal government. * This information is correct as of 10/14 but is subject to revision by Congress. 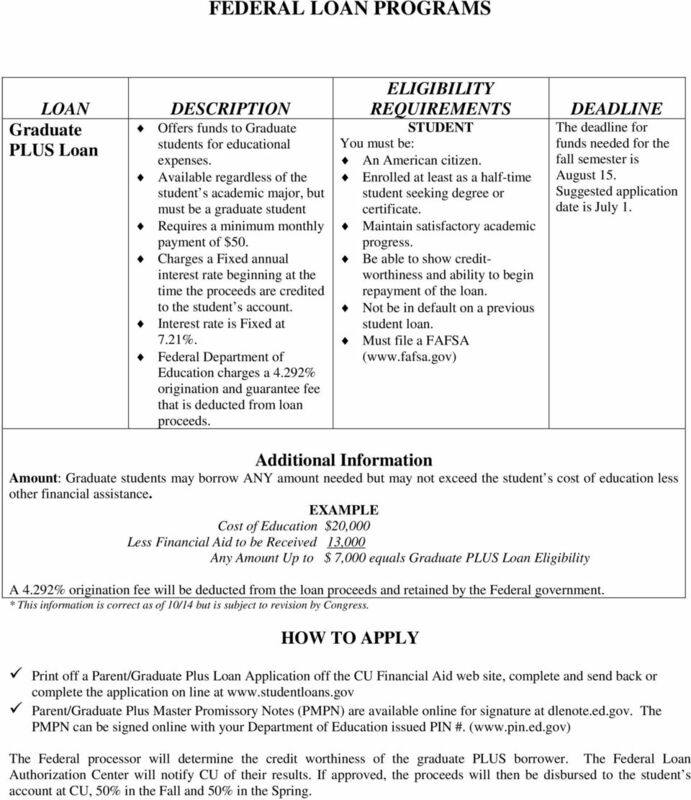 Print off a Parent/Graduate Plus Loan Application off the CU Financial Aid web site, complete and send back or complete the application on line at Parent/Graduate Plus Master Promissory Notes (PMPN) are available online for signature at dlenote.ed.gov. The PMPN can be signed online with your Department of Education issued PIN #. ( The Federal processor will determine the credit worthiness of the graduate PLUS borrower. The Federal Loan Authorization Center will notify CU of their results. If approved, the proceeds will then be disbursed to the student s account at CU, 50% in the Fall and 50% in the Spring. 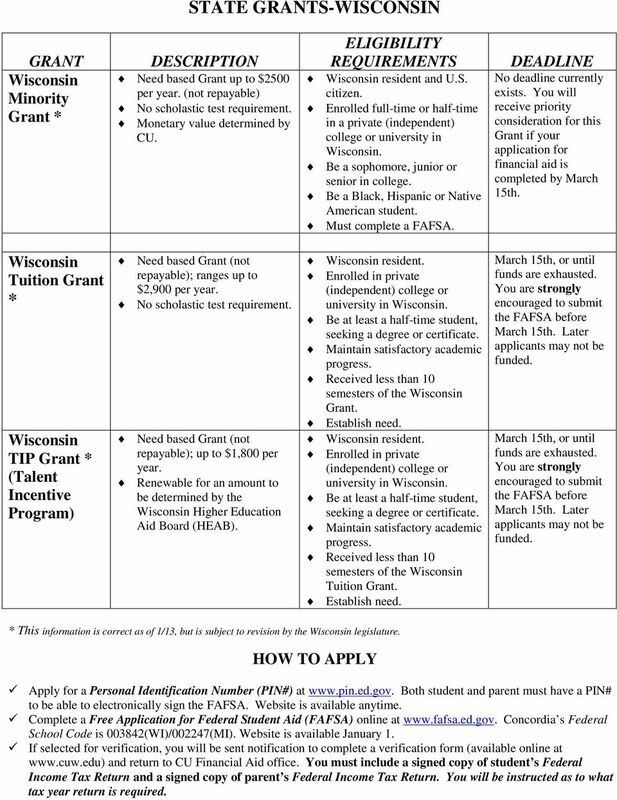 8 STATE GRANTS-WISCONSIN GRANT Wisconsin Minority Grant * Need based Grant up to $2500 per year. (not repayable) No scholastic test requirement. Monetary value determined by CU. Wisconsin resident and U.S. citizen. Enrolled full-time or half-time in a private (independent) college or university in Wisconsin. Be a sophomore, junior or senior in college. Be a Black, Hispanic or Native American student. Must complete a FAFSA. No deadline currently exists. You will receive priority consideration for this Grant if your application for financial aid is completed by March 15th. Wisconsin Tuition Grant * Wisconsin TIP Grant * (Talent Incentive Program) Need based Grant (not repayable); ranges up to $2,900 per year. No scholastic test requirement. Need based Grant (not repayable); up to $1,800 per year. Renewable for an amount to be determined by the Wisconsin Higher Education Aid Board (HEAB). Wisconsin resident. Enrolled in private (independent) college or university in Wisconsin. Be at least a half-time student, seeking a degree or certificate. Received less than 10 semesters of the Wisconsin Grant. Establish need. Wisconsin resident. Enrolled in private (independent) college or university in Wisconsin. Be at least a half-time student, seeking a degree or certificate. Received less than 10 semesters of the Wisconsin Tuition Grant. Establish need. March 15th, or until funds are exhausted. You are strongly encouraged to submit the FAFSA before March 15th. Later applicants may not be funded. March 15th, or until funds are exhausted. 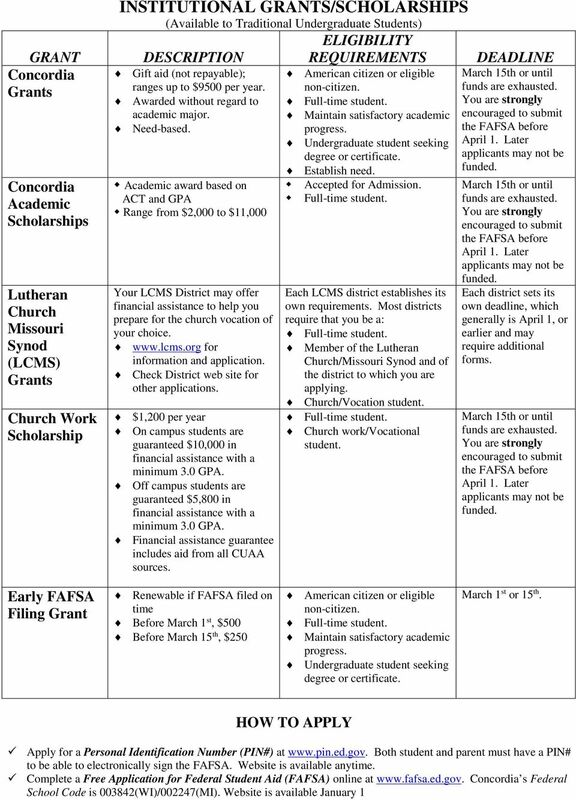 You are strongly encouraged to submit the FAFSA before March 15th. Later applicants may not be funded. * This information is correct as of 1/13, but is subject to revision by the Wisconsin legislature. Apply for a Personal Identification Number (PIN#) at Both student and parent must have a PIN# to be able to electronically sign the FAFSA. Website is available anytime. 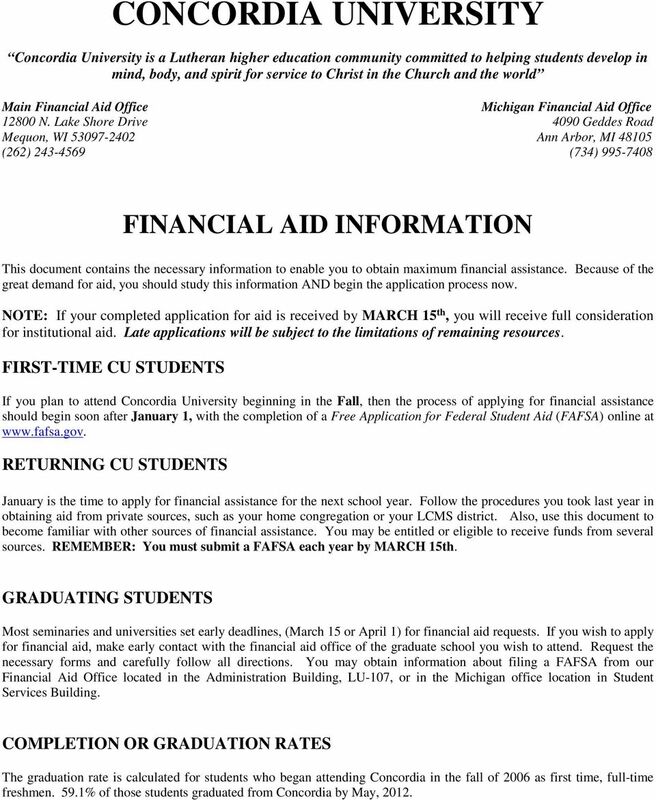 Complete a Free Application for Federal Student Aid (FAFSA) online at Concordia s Federal School Code is (WI)/002247(MI). Website is available January 1. If selected for verification, you will be sent notification to complete a verification form (available online at and return to CU Financial Aid office. You must include a signed copy of student s Federal Income Tax Return and a signed copy of parent s Federal Income Tax Return. You will be instructed as to what tax year return is required. 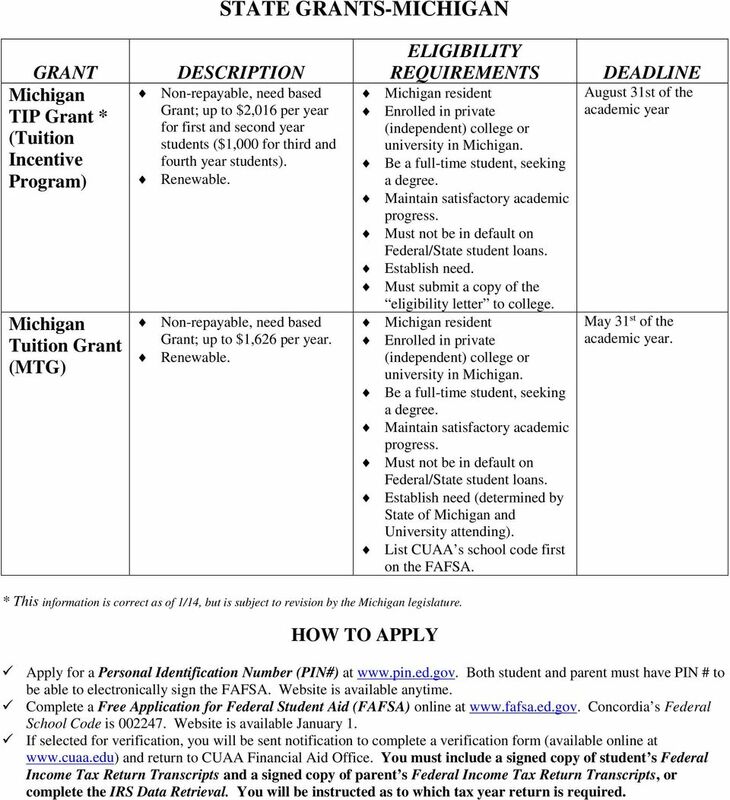 9 STATE GRANTS-MICHIGAN GRANT Michigan TIP Grant * (Tuition Incentive Program) Michigan Tuition Grant (MTG) Non-repayable, need based Grant; up to $2,016 per year for first and second year students ($1,000 for third and fourth year students). Renewable. Non-repayable, need based Grant; up to $1,626 per year. Renewable. Michigan resident Enrolled in private (independent) college or university in Michigan. Be a full-time student, seeking a degree. Must not be in default on Federal/State student loans. Establish need. Must submit a copy of the eligibility letter to college. Michigan resident Enrolled in private (independent) college or university in Michigan. Be a full-time student, seeking a degree. Must not be in default on Federal/State student loans. Establish need (determined by State of Michigan and University attending). List CUAA s school code first on the FAFSA. August 31st of the academic year May 31 st of the academic year. * This information is correct as of 1/14, but is subject to revision by the Michigan legislature. Apply for a Personal Identification Number (PIN#) at Both student and parent must have PIN # to be able to electronically sign the FAFSA. Website is available anytime. Complete a Free Application for Federal Student Aid (FAFSA) online at Concordia s Federal School Code is Website is available January 1. If selected for verification, you will be sent notification to complete a verification form (available online at and return to CUAA Financial Aid Office. You must include a signed copy of student s Federal Income Tax Return Transcripts and a signed copy of parent s Federal Income Tax Return Transcripts, or complete the IRS Data Retrieval. You will be instructed as to which tax year return is required. 11 If selected for verification, you will be sent a notification to complete a verification form (available online at and return to CU Financial Aid office as well as needing to send in tax transcripts. HOME CONGREGATION In an indirect way, your HOME CONGEGATION may be assisting you with some of your educational expenses. Concordia receives financial support from the Lutheran Church-Missouri Synod of which your congregation may be a contributing member. Concordia encourages you to inquire about possible assistance from your congregation. Congregation contributions are in excess of the guarantee of funding for Church Work Students entering the University. DISTRICT GRANTS LCMS Districts accept applications for assistance each year. The LCMS District application is available on line at some districts require in addition their own form, please check with home district.